Last year, three Rwandan coffee brands started trading on the e commerce platform, Alibaba under the Electronic World Trade Platform. 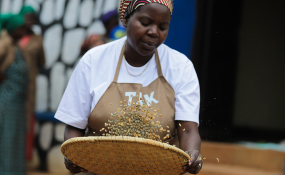 Ten coffee brands from Rwanda will be cupped and tasted today in the Chinese city of Xian. Organised by AfriCo, a Chinese firm with interest in Africa, the event will feature Gorilla Coffee, Bourbon Coffee, Cafe de Maraba, Three African sisters Coffee and Question Coffee among others. The event will be attended by companies, individuals as well as representatives from eight embassies including Iran, Mauritius, South Africa, Rwanda, Senegal, Somalia, and Tanzania. LI Qing, the Founder of AfriCo, said that the event focuses on China-Africa cultural exchanges and business cooperation. "Rwandan coffee is such a great quality and more Chinese people should know. The best way to promote Rwandan coffee is to build the Rwanda brand image, make the Chinese customers believe its good taste," she said. Coffee trade volumes between Rwanda and China are rising steadily. Last year, three Rwandan coffee brands started trading on the e commerce platform, Alibaba under the Electronic World Trade Platform. According to Dr. Celestin Gatarayiha the Head of Coffee Production and Processing Division at National Agricultural Export Development Board, Rwanda exported 24000 metric tonnes last year and it fetched about $67 million. This year, the country targets to fetch about $75 million from coffee exports.